In 2-quart saucepan, mix barbeque sauce with pork. Cook over medium-high heat, stirring occasionally, until thoroughly heated. Meanwhile, spread half of each tortilla with sour cream. Top sour cream side of each tortilla with 1/4 of pork mixture, 1 tablespoon salsa and 2 half-slices cheese. Fold tortilla over onto filling. Spray 12-inch skillet with cooking spray; heat over medium-high heat. 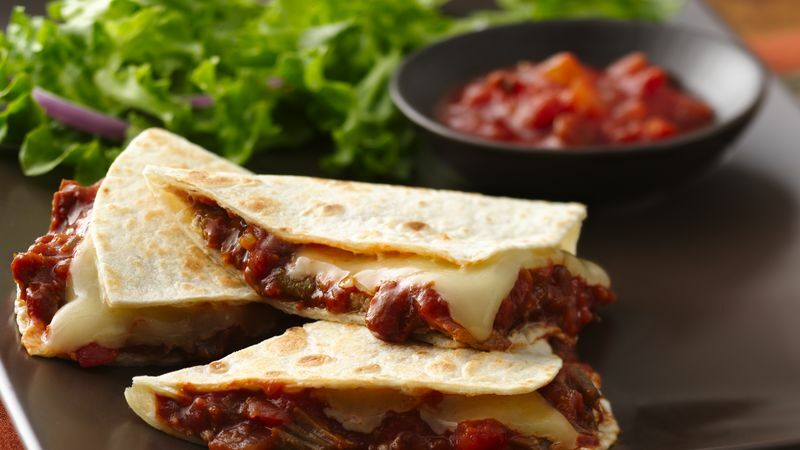 Add 2 quesadillas at a time to skillet; cook about 3 minutes, turning once, until filling is heated and tortillas are golden brown. Repeat with remaining 2 quesadillas. Cut into wedges; serve with remaining salsa. Refrigerated barbeque sauce with shredded pork can be found in the meat section of the grocery store.